The Addison Fire Protection District Board of Fire Commissioners is appointed by and works under the direction of the Board of Trustees. The Board of Fire Commissioners is tasked with matters concerning the hiring, promotions, discipline and termination of commissioned and sworn personnel. 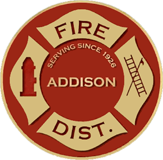 The Addison Fire Protection District Board of Fire Commissioners conduct open regular meetings the second Tuesday of the month at 6:00pm in the headquarters fire station located at 10 South Addison Road.